I'll start: "Stop in the name of LOVE." That was the first thing that came to my mind too! 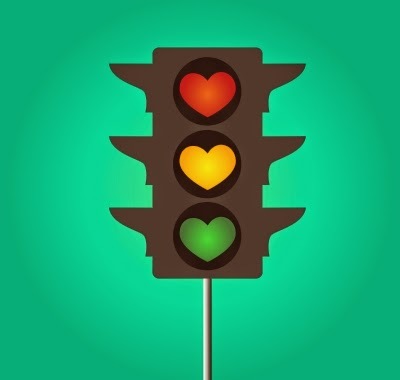 How about give love the green light but use caution. Sorry, I wrote the most obvious answer! I don't know how you come up with such clever answers every week! I love both answers thus far. Excellent answer, Mary. I love it! The images always bring songs to my mind too, Rita! Great answer! Or STOP IN THE NAME OF LOVE!!!! I like that one better.. lol That is my final answer. Sorry so late, been a terribly long day here. Hey Linda! So sorry you've had a long day. Hope everything is okay! Great answers, all!